Home > Law Books > Treatises > Modern Scientific Evidence: The Law and Science of Expert Testimony, 2018-2019 ed. 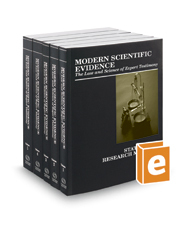 Modern Scientific Evidence: The Law and Science of Expert Testimony, 2018-2019 ed. Modern Scientific Evidence: The Law and Science of Expert Testimony helps judges and lawyers assess the validity of an expert's scientific methodology, following the scientific evidence issues raised by the Daubert ruling. The text challenges the use of “generally accepted” scientific ideas when ruling on admissibility or managing expert witnesses in state and federal courts, and prepares trial attorneys to explain scientific concepts during admissibility arguments and confidently elicit or challenge expert testimony during trial. It also examines specific topics, discussing current law and science in each.